Another week and another three great freeware games for you to check out. A couple of them are even cross platform, so you Mac and Linux folks can also have a go. This week I've included two great 2D platformers into the mix and the third game is an exceptional work of interactive fiction created by Christine Love which explores topics oft not explored in many games. Here is my look at the Caanoo handheld the latest offerings from Gamepark Holdings. Windows Solitaire: The #1 Computer Game in the World Overhauled for Vista? Although we're all avid gamers here who would most likely enjoy playing Robotron or M.U.L.E. as much as the latest first-person shooter featuring humanoids with working pituitary glands, I bet most of us spend next to no time playing Windows pack-in games--those things that show up under "GAMES" on most Windows computers--you know, Solitaire, Free Cell, and so on. Well, apparently we're in the minority--at least according to GamerScore, who claims that Windows Vista's updated in-the-box games are so much better than the originals that even Mac-heads may end up addicted to them. Basically, what we're talking about here are improved animations. Neverball: Who says FOSS games are primitive?Terry Hancock of Free Software Magazine has published a wonderful review of several free software games for the GNU/Linux platform--and the best part is, he selected them based on the folks who would know (his kids!). I was struck by how many of these titles resemble some of my favorite Amiga shareware games, like Atomic Tanks and MOAGG (a Thrust clone). 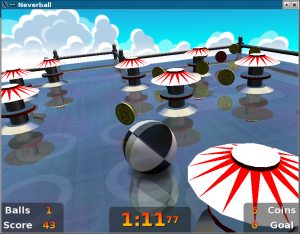 There are also some good-looking shooters, several strategy games, and a really sweet-looking 3D pinball game called Neverball. I strongly recommend that you head over to FSF and check out Terry's reviews!